A bowl of fruit waited on the coffee table. A decanter of sherry was ready for pouring. Slippers for weary feet, a wool throw for chilly legs, even a stand for my hat. Fresh chilled milk was offered for tea. The thoughtful touches were everywhere. Every detail of my stay had been seen to before I arrived. 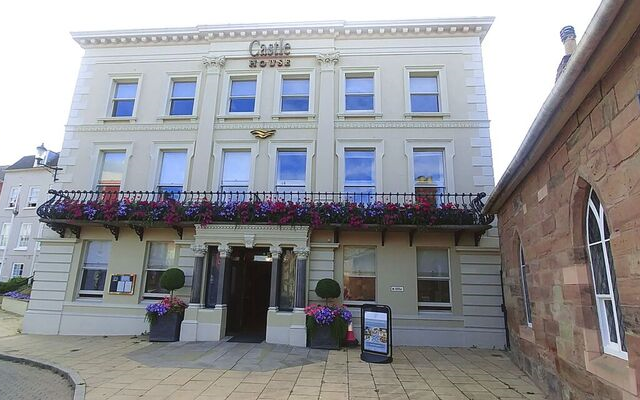 Castle House Hotel is a ‘we didn’t leave the hotel all weekend’ retreat in Hereford. The historic building has been restored with lavish attention to history, comfort, and eco-friendly details. The former castle moat, below the terrace, is a sanctuary for waterfowl. 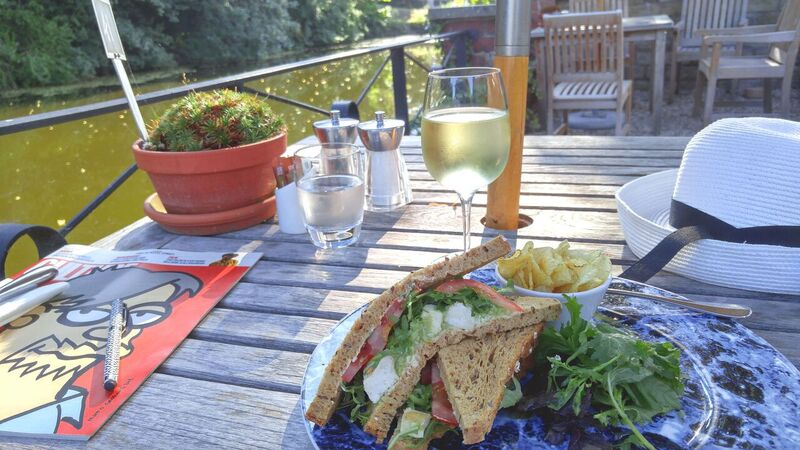 Bird watchers, tea and wine sippers all enjoy the waterside terrace. The hotel is privately owned by the Watkins family. The Grade II listed Georgian villa sits proudly at the top of Castle Street in Hereford’s old-town district. All that remains of the 12th-century, Hereford Castle, is the moat that borders the split-level garden and terrace. The old castle was a strong-hold in the 12th and 13th-centuries. After a Civil War in the 17th-century, the castle was demolished. The grounds became public lands. The former Castle Green is behind the hotel, across the moat. 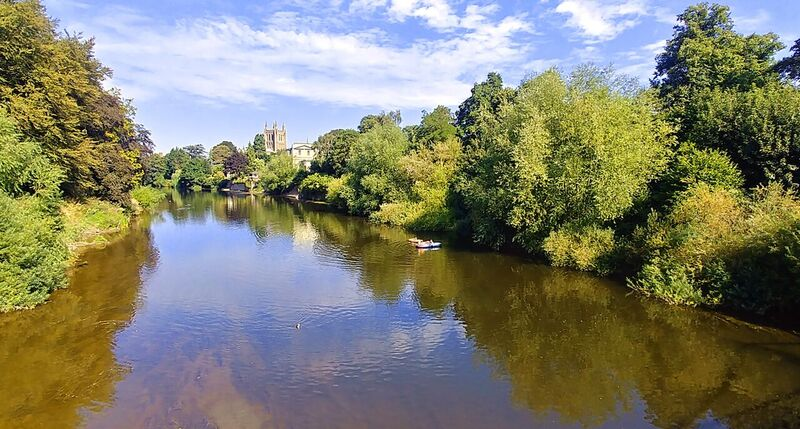 The green is one of Hereford’s stunning parks with footpaths for exploring the town, riverbanks, and gardens. A pair of Georgian Villas was built on the old castle site in the early 18th-century. Eventually, the adjoining wall was removed, and the building became a boarding house. 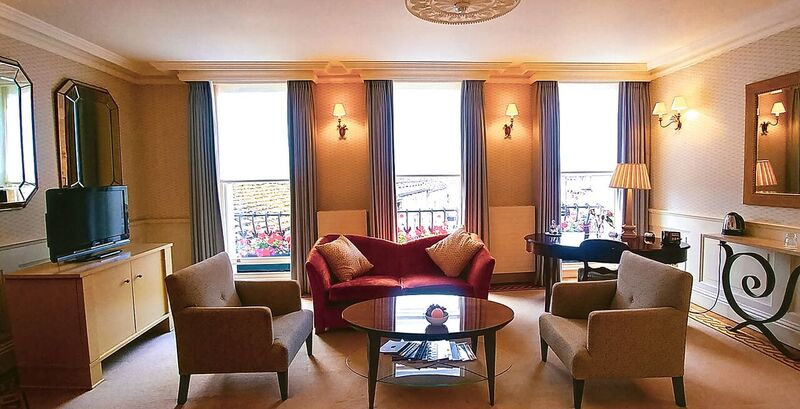 In the 1940s, the hotel was transformed into the exquisite accommodations enjoyed today. Twenty-four unique and traditionally styled rooms and suites provide guests the most elegant accommodations in Hereford. Townhouse suites with direct garden access, or rooms overlooking the garden and Castle Moat, all offer remarkable attention to comfort and luxury. Fine custom-made linens adorn each bed. 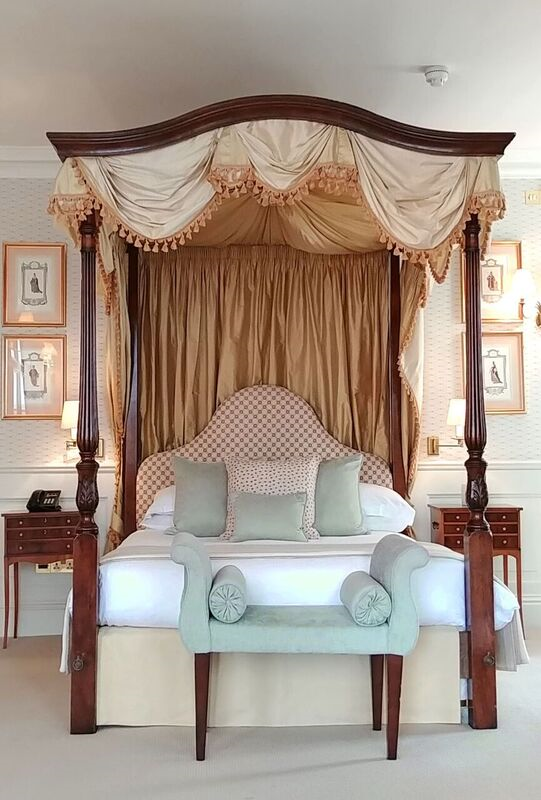 The four-poster bed in the Royal Suite is a hand-crafted reproduction of an original Georgian piece that once graced the bedroom. The modern marble and porcelain baths are planned with indulgence in mind. Oversized bath sheets and decadent terry robes are irresistible for lounging about your suite after a bubble bath in the deep soaking tub. L’Occitane essential oil toiletries pamper your body and your senses. Water saving fixtures help accomplish the Castle House goal of maintaining sustainable operating practices that are earth and guest friendly. A heavenly part of a Castle House experience is eating, drinking, and socializing. 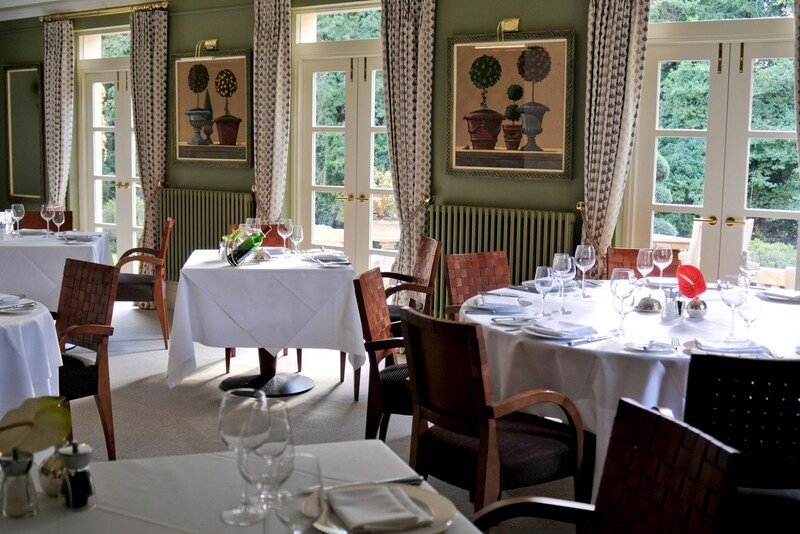 The menus are a tempting mixture of original and traditional dishes, each executed as works of art by Chef Claire Nicholl and her team. 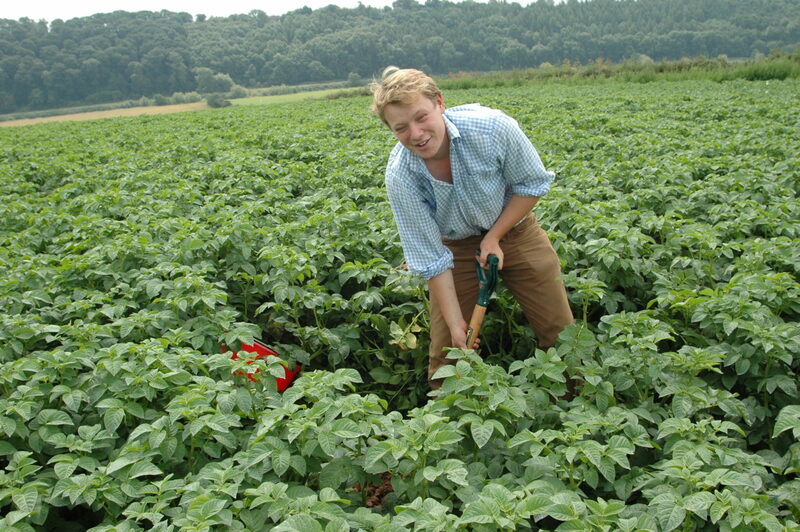 They work with Herefordshire farmers and producers to bring their passions to Castle House guests. Fresh seafood from Bristol, is served seasonally, Ballingham Beef is always available. Wines, spirits, and beer are sourced from local wineries, breweries, and distilleries. Inviting cocktails are made from the farm’s herbs and flowers, mixed with local spirits. A G&T from hand-crafted local gin is the perfect al fresco libation. The terrace is a bucolic setting for long, lazy lunches, afternoon tea, or sunset bubbly and dinner. Indoors, the Ballingham Bar serves casual fare and drinks. The Ballingham Bistro serves a full menu for breakfast, lunch, and dinner. Castle House kitchen is supplied daily with ‘just picked this morning’ ingredients from 10-miles away. The hotel owner’s organic farm, Ballingham Hall, is the supplier. 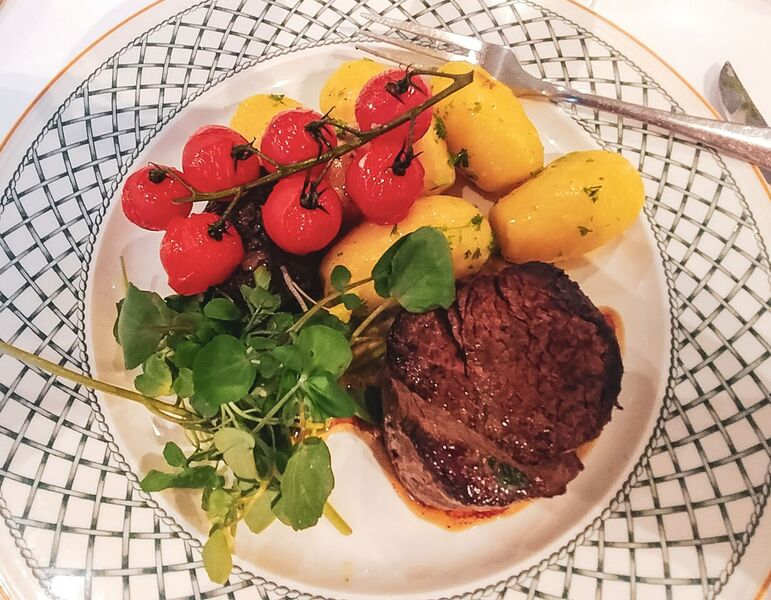 Ballingham Beef (raised only at Ballingham Hall), plus organic fruit and veg are always included on seasonal menus for the bar, bistro, and terrace. The splendid Hereford Cathedral has been a site for worship since the 8th-century. In the world-renowned cathedral library, a 13th-century calf-skin map of the world and a 17th-century chained library have been safeguarded for 100s of years. The cathedral is within sight of the hotel. It’s a three-minute walk. The Castle House commissioned two walking tours of Hereford for their guests. The Historic City Walk takes you to the old town area, passing through the Butter Market, black and white houses, and around the cathedral. 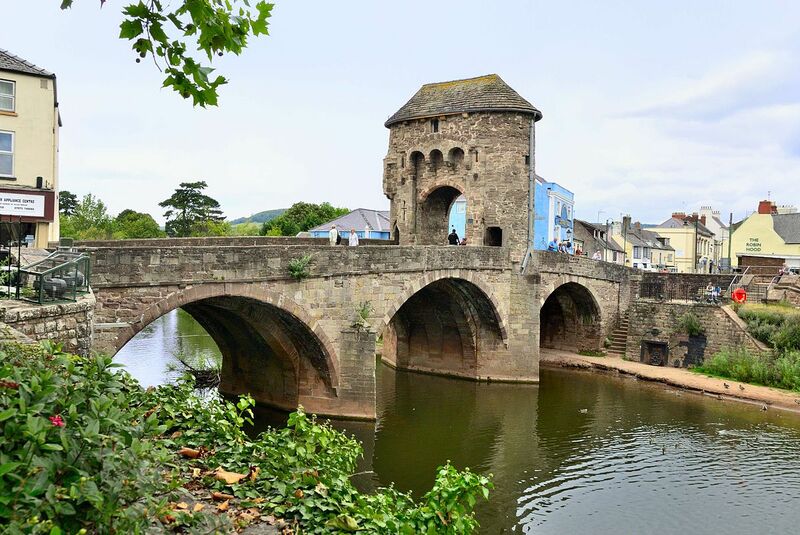 The Riverside Walk takes you for a stroll along the River Wye passing over and under bridges. The Roman Bridge and Victoria Bridges are exceptional photo ops. Guides are available from the concierge. Ask the concierge if a tour of Ballingham Hall Farm can be arranged. You’ll tour the grounds, gardens, pastures, and the family’s 13th-century Church of St Dubricius. Your next meal at Castle House will take on a new perspective. The river Wye is canoe and kayak friendly. The scenery is a combination of woodlands and riverside homes and businesses. Tie-up at a pub and have a cider break. Many varieties are made in this part of England. Ask the concierge for outfitters and tours on the water or 2-wheels. Thank you Terry. Did you live in Hereford? Your description painted a picture of a what sounds like a wonderful place to stay. Very enticing indeed. I’ve been waiting to find out what you did in the UK – it was worth the wait. 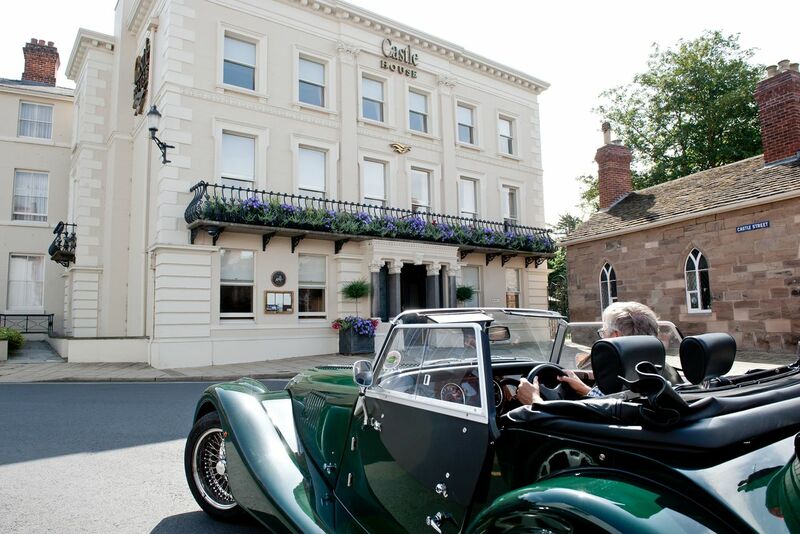 What a beautiful article of your time spent at Castle House Hotel, Hereford, with pictures that bring it to life. Beautiful pictures, both actual and visually word crafted Mary. Thank you for this look!